Welcome to the Sunset on the Beach Premiere Post. Please read these notes and rules before clicking the View Updates button below. 1) Any spoilers mentioned in this post are ONLY to be discussed in THIS thread. We will run a ZERO Tolerance policy for anyone posting spoilers outside of the comments on this thread. 2) We have about 30+ people on twitter who are all sending updates, these vary from regular fans to journalist such as Kristin from E!Online, EW and TV Guide. This will mean there will be lots of duplicates, some off topic chatter, and potentially colourful language. The tweets are completely unmoderated. 3) Some people will be posting spoilers if they get time during the airing of Premiere tonight. 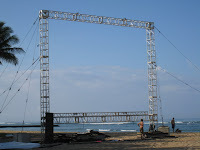 Others will capture the build up to it, photos of crowd/crew/cast/Red carpet etc. Maybe the odd video etc. 4) It will probably be fairly chaotic but should be fun to follow. 5) This link might have some videos of the event. The events should start around 6:00pm Hawaii time, however we’re opening this post up early as there will no doubt be photos/info as the crowds build up along with other info/news. Here is a link to a worldclocks table to see the various timezones. There is also a Live Webcam that updates every minute or so here. Thanks to Taylor for the link. If the twitter gadget below is not working we have another widget below. Thanks to John for the photos.